It was a great day for racing at New Smyrna Speedway. The Florida Mini Stock Challenge Series was on hand for a 100 lap event, in support of the Florida Governor’s Cup race for Super Late Models. 24 of the fastest Mini Stocks in Florida were entered to compete for the win in this race that is considered by many to be the Premier Mini Stock race in the Southeast. Qualifying turned out to be very interesting, on and off the track. Clint Foley turned the fastest lap on the track, followed by Jarred Allison, and Robbie Storer. When the top qualifiers went through inspection after qualifying, Foley’s time was dis-allowed due to a rules infraction. This moved Allison into the top spot, although not for long. Series officials ad decided to allow Foley to start the race from the rear, with a significant weight penalty. Allison felt that Foley should not be allowed to race in the event, and withdrew his car in protest. This moved Robbie Storer into the top qualifying spot. After the draw for inversion, Storer found himself starting from the #9 positon. As the field came to the green flag to start the 100 lap event, Robbie Yoakam powered to the lead, followed by James Ellis and Steve Griffin. The battle for position was really heating up early in the race, with Griffin and Marty Neikens moving into 2nd and 3rd on lap 6. By lap 10, Neikens had moved into second, followed by Dorer, Camp and Zimmerman. As the battle for second continued to be heated, Yoakam was opening a lead on the pack. It took until lap 18 for Dorer to move into second with Camp right on his bumper. Dorer was able to catch Yoakam and around lap 22 make the pass for the lead. The first caution came out on lap 24 for a spin in turn 4, and the field was quickly reset for the start. The field took the green and the hard racing continued right where it left off. Camp worked Yoakam hard for several laps and was finally able to make the pass for second on the high side. After getting around Yoakam, Camp caught Dorer and was able to take over the lead. Meanwhile, Cody Blair, Zimmerman, Storer and Foley were working toward the front of the field. Just before halfway Foley was able to move into 3rd spot while Storer was sidelined with mechanical problems. Lap 46 saw caution once again on the speedway as the 96 of Mark Moniz broke an engine and dropped oil on the racing surface. As the track was being cleaned the field reached the halfway point and was led into the pits for their fuel stop. When the field returned for the start the running order was Camp, Dorer, Foley, Yoakam, Neikens, Zimmerman, Webb, Blair, Ellis, and Birk in the top ten. The second half of the race was slowed by several cautions and the field was being shortened by attrition. Foley used the double file restarts to his advantage to pass Dorer for second place and went to work on Camp trying to take the lead. Foley took the lead on a restart around lap 80, but Camp made him work for it. Foley finally cleared Camp and Dorer followed through the opening to grab second. With onlya very few laps remaining, Camp’s car slowed somewhat and started drifting back in the field. The race ended with Foley taking the checkered flag for the win followed by Dorer and Blair, who had made a great run from deep in the field. When the top finishers went to post race tech inspection, Foley’s car didn’t meet the specified weight, and was disqualified, giving the win to Dorer. 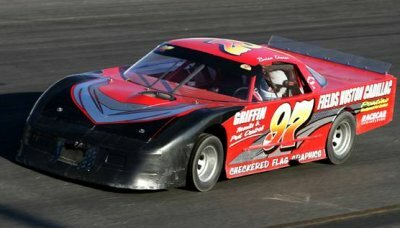 Although Storer didn’t finish the race, he was still able to take the season point championship, while Chris Zimmerman took the rookie crown for the 2007 season.